The rigs rolled into town on Thursday night, picking their way across the green baize of the sports field in the twilight, an evening of scaffold assembly and kitchen prep stretching ahead once the wheels came to rest. 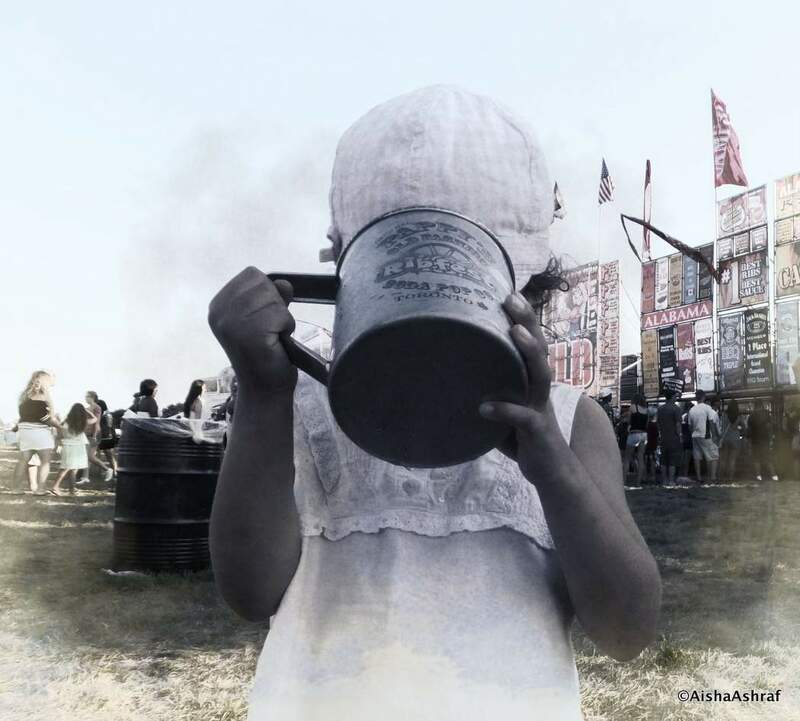 By 11am the next morning fluttering flags, towering billboards and palls of smoke proclaimed the 2nd annual Whitby Ribfest open for business, the aroma of barbequed meat causing a tsunami in the mouth of anyone within olfactory range. The same touring ribbers from across North America that descended on Whitby last year were here again, swelled by the addition of two more outfits bringing the total teams to nine. Pilot fish to this carnivorous behemoth, the carnies busied themselves setting up their rattletrap fairground favorites whose peeling paint and world-weary appearance welcomed night-time’s forgiving cloak, when the colour and dazzle of bright lights brought a beauty unseen in daylight’s glare. My taste-buds had happy memories of last year’s beef ribs from Silver Bullet (check out that post for more great photos), so I couldn’t wait to go back and broaden my waistline cultural experience; this time I had plans for a Blooming Onion and a tin mug of ice-cold cream soda as well. Music filled the air from, among others, Jessica Tyler (Jenna on Degrassi if that helps), Patrick Dune, The Colts, Two For The Show and some teenage bleached frustrated rocker, for whom the term ‘caterwauling’ was a descriptive of extreme accuracy. He assaulted our eardrums for three agonising… I suppose you’d call them songs but I use the term loosely. The din made the beaming bronzed Amazon taking my order (a shockingly identical Canadian doppelganger of someone I knew back home) wince and turn around to twist up the volume on the stereo behind her, before sheepishly confessing to having a brother with a band ‘just like that’. The milieu of ‘down-home’ Canadiana baked under a blazing sun and, with the kind of impeccable timing few expect from us, we rocked up just in time to catch the rib-eating contest. Ten largely stocky individuals (a lone female among them this year) took their seats behind a long table at crowd level in front of the stage. One stood up again once the eating began – this was serious stuff and everyone had their modus operandi. Another contestant was the manager of one of the ribbing teams and did this on a weekly basis – sounds like some kind of purgatory to me. As the allotted twelve minutes ticked down, faces became smeared and eyes glazed as contestants zoned out, concentrating on one rib at a time instead of the mountains of liberally sauced meat and bone filling the foil trays in front of them. Stewards were on hand to open bottles of water for them; all things considered BBQ sauce isn’t a substance that lends itself well to the traction required to undo a screw-cap. The whole episode failed to impress our kids who couldn’t understand what the draw was, or the sudden interest in people doing stuff they got told off for at home. Even the possibility of watching someone throw up couldn’t lessen their boredom in the merciless sunshine so they amused themselves by trampling my feet and nudging me when I took photos. I have to say I shared their view, though my reasons were somewhat different. With an established dislike of the TV show ‘Man Vs Food‘, I already had reservations about an activity that casts greed in a competitive light. I don’t think our society needs any help with that. For every ‘Have’ there are so many ‘Have Nots’ – I can’t make the leap to forgetting that and seeing this as entertainment. But enough of that – I’m not climbing on my soapbox today, just sharing a slice of North American culture pie with you. Disappointingly, depending on your point of view and physical location, there were no technicolour yawns and the winner ended up putting away 6lbs of ribs to claim the trophy. The kids were glad when it was over and made a beeline for the ice-cream truck. I hate Man vs Food too! The rib fest must have been 10,000 times worse…with several men shovelling food (meant for a party of 100) down their throats…Brave of you to actually go there and take pictures! Great article, Aisha! I haven’t been to a rib eating contest but I have been to Scarborough Ribfest, which was quite similar to what you describe. The fact that so many people in the Western World eat ribs and similar food on a regular basis scares me much more than a one-day, bizarre, fun show like that one. I can never watch these eating contests, the way they scarf down their food just turns my stomach.